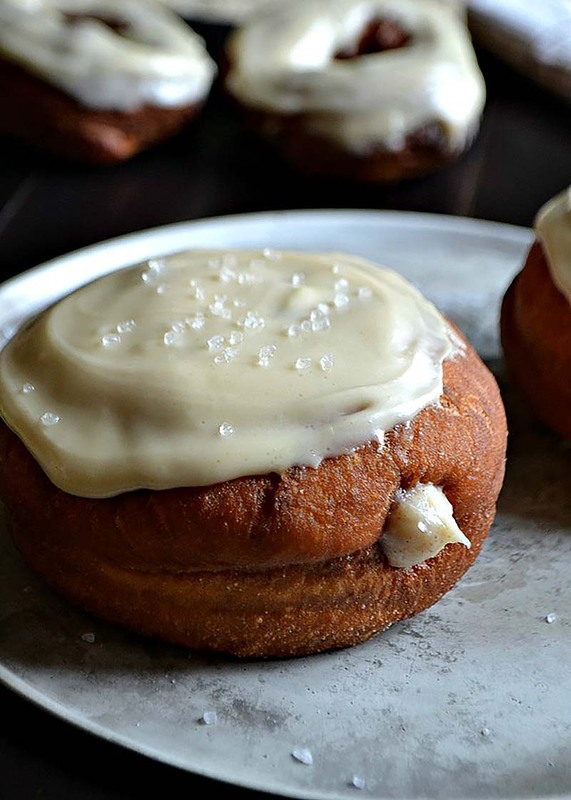 Deep fried pumpkin yeast doughnuts, filled with cinnamon cream cheese frosting and topped with a sea salted maple glaze. In a small bowl add yeast and warm water until the yeast has dissolved. After about 5 minutes, once it is bubbly or appears foamy, it is ready to use. In the bowl of an electric mixer with a dough hook attachment, add in milk, eggs, pumpkin puree, oil, salt, pumpkin pie spice, maple syrup, sugar, yeast/water mixture and 2 cups of flour. Beat vigorously. Add in remaining flour, ½ cup at a time, until dough is firm enough to knead. Not too sticky. Turn dough out onto a floured work surface and knead for about 6 minutes or until smooth and elastic. Turn dough into a oiled bowl. Cover in a warm spot and allow to rise until doubled in size. On a floured surface roll dough out into a large circle about ¾ of an inch thick. Using a 2 to 3-inch round cookie cutter, cut out donuts. Place them on a lined cookie sheet to rise again. With the extra dough scraps you can shape ring-shaped doughnuts or roll them into balls for "doughnut holes." Allow doughnuts to double in size again. Meanwhile heat cooking oil to 365°F. Once the doughnuts have risen, fry 1-3 at a time depending on how large your fryer or pot is. Careful not to over crowed them. Fry for approximately 2-3 minutes flipping half way through the process to evenly brown. Once they are golden brown remove from oil with a spatula and place on paper towels to "drain". Once all the doughnuts are done, allow to cool. Prepare filling and icing. To prepare FILLING: With an electric mixer whip cream cheese until light and fluffy. Slowly mix in powdered sugar and cinnamon. If it appears too thick mix in 1 tbsp of cream at a time to thin it out a tad. To prepare ICING: Whisk your maple syrup and powdered sugar together until smooth. To assemble doughnuts: Cut a small hole straight through the center of each doughnut, going all the way to the back but careful not to cut through the other end. Fill piping bag with a medium sized tip with the cream cheese filling. Fill each doughnut with the filling. Spread maple glaze over the tops of each filled doughnut and sprinkle lightly with sea salt. If you have left over frosting and icing spread onto fried doughnut scraps as well. This recipe was created by Bakeaholic Mama. I’m out of my red star rapid rise yeast. All I have is instant yeast (which I’ve never used but it was a thoughtful gift from my momma) will that work here? If so when/where/what step do I add it? Thanks a bunch! Can’t wait to try these! Is it vegetable oil, you forgot to put oil. Happy baking (or should I say ‘frying’)!